Publisher: Swan Sonnenschein; then: George Allen & Unwin. Country: United Kingdom. Date: 1901-13.
by Hugh Montgomery and Philip G. Cambray. London, Swan Sonnenschein and Co, 1906 (Sonnenschein's Reference Library , 10). Hardback bound in royal blue cloth with blind stamped boards and with titles and decoration on spine. Text in two columns. 406 pages. 1. Dictionary of Quotations (English) - P. H. Dalbiac [Col. Philip Hugh Dalbiac]. 2. Dictionary of Quotations (Classical) - T. B. Harbottle [Thomas Benfield Harbottle]. 3. Dictionary of Quotations (French and Italian) - T. B. Harbottle and P. H. Dalbiac. 4. Dictionary of Quotations (German). With Authors' and Subjects' Indexes - Lilian Dalbiac. 5. Dictionary of Contemporary Quotations (English) - H. Swan [Helena Swan]. 6. Famous Sayings and their Authors: A Collection of Historical Sayings in English, French, German, Greek, Italian and Latin - E. Latham [Edward Latham]. 7. Dictionary of Historical Allusions - T. B. Harbottle. 8. Dictionary of Battles from the Earliest Date to the Present Time - T. B. Harbottle. 10. 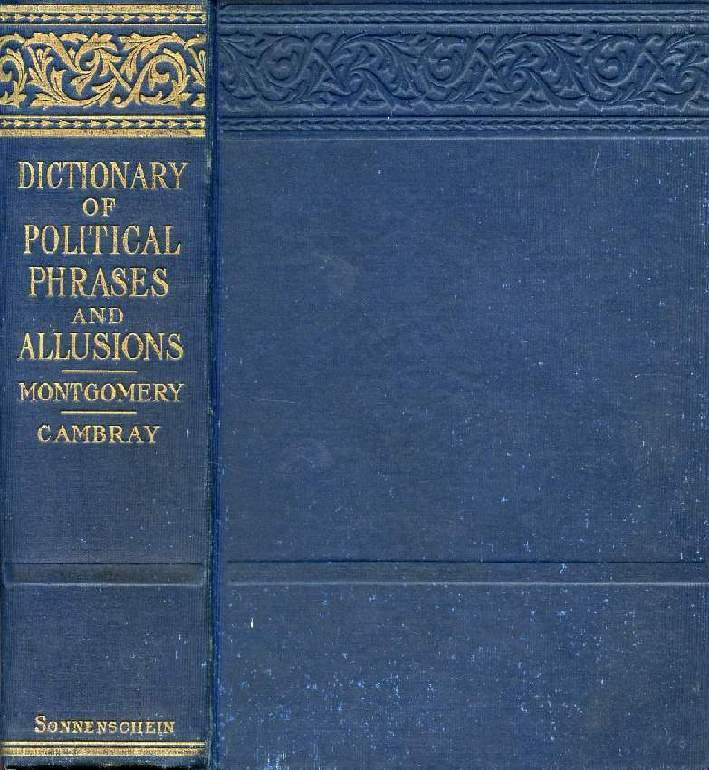 A Dictionary of Political Phrases and Allusions, with a Short Bibliography - Hugh Montgomery and P. G. Cambray [Philip G. Cambray]. 11. Dictionary of Quotations (Spanish) - T. B. Harbottle and Major Martin Hume. 12. A Dictionary of Oriental Quotations (Arabic and Persian) - Claud Field [Claud Herbert Alywn Field]. 13. Dictionary of Abbreviations, being Citations of those Terms used in the Professions, Sport and Trades - The Late Walter T. Rogers, F.R.S.L..